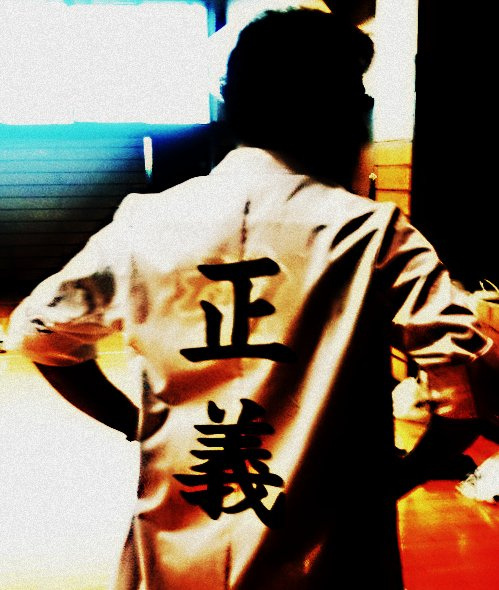 Justice (SEI-GI) is printed on the back of this man`s labcoat, which brings to mind Fukushima and the many who are suffering from this tragedy and the injustice of government misinformation and manipulation in Japan. The Fukushima problem is here to stay. There is no way around it. The media attention has subsided but news continues to trickle out supporting the fact that this calamity is far from over. The latest news being the announcement of Tokyo Electric admitting to not only 3 meltdown reactor cores but 3 melt-throughs?! This is unprecedented news! There is highly concentrated radioactive waste literally leaking out from 3 reactor containers! This is beyond anything that has ever happened in the history of nuclear power. We are in uncharted territory and experts can only postulate how the environment will react to this extremely harmful and deadly material. Some say that if this material hits the water table or ground water we could see another hydrogen explosion or perhaps the environment will begin to absorb and disperse the radioactive waste poisioning the entire ecosystem. It is as if pure concentrated evil has been let out of the jar! The truth of the matter is that Japan will never be the same. The Fukushima Prefecture and Kanto Region of Japan will never be as it was before all this happened. The consequences will no doubt extend beyond human control and people will have to live with the fact their country may become an inhabitable wasteland in decades, and generations to come. Plant life and animal life will be the first to show effects of radiation. Like the little earless rabbit born in Fukushima a month after the incident. 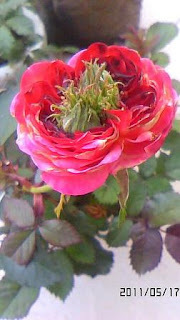 Also many people are witnessing mutations in flowers. People are posting on blogs and twitter from many places mostly within the Kanto region with photos of strange flowers including Tokyo. 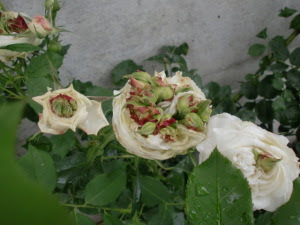 Photo taken from a garden in Fukushima shows multiple mutations in the roses. This mutation was taken in Shiga on the other side of Japan which makes you wonder how far this radiation may go. ﻿The scary thing is that the people in Japan do not know how long this crisis will continue or how bad the effects may be to them and their children. How long do you hold out until you realize that you and your loved ones may be in great danger? The Japanese government has shown that it cannot be trusted because of its new policies that can hardly be considered safe (in the long term) and the lack of providing up to date information of radiation levels and plant conditions. In fact Japanese who are trying to evacuate to other prefectures are being denied housing that was once offered to them a month ago because the government has now declared their current region safe. Sunflowers being planted outside Yabashira Station in Matsudo, Chiba. One of the radioactive hotspots being observed in Japan. Photo taken June 2011. 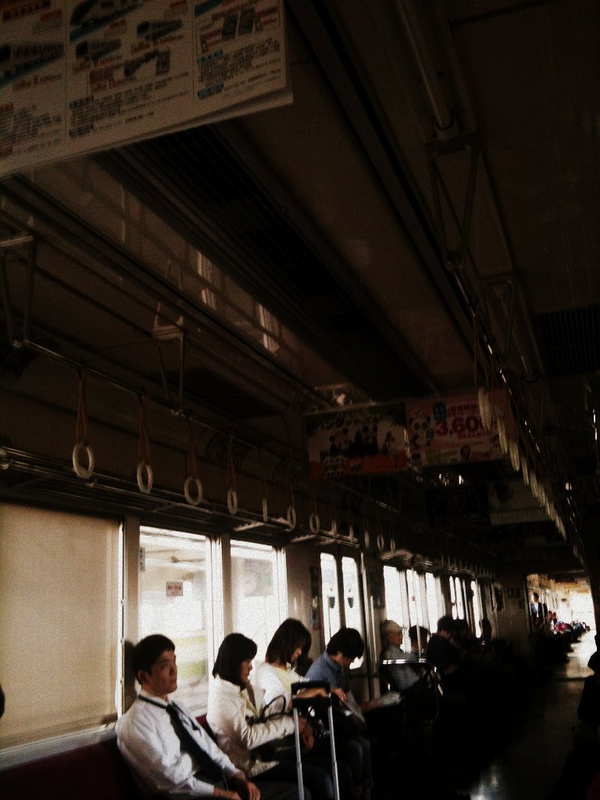 ﻿ The effects of the Fukushima crisis will also be felt as power use is drastically reduced this summer. 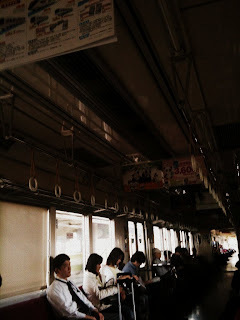 Trains will run with no or minimal lighting. Air conditioning in public and commercial buildings will be cut drastically. This summer is predicted to be a very hot summer in Japan and it may cause many to die of heat stroke since power will be short. Staying hydrated and carrying a fan, along with Cool Biz fashion are planned to be promoted throughout Japan. This story just seems to get worse.... I can't help but think of the apocalyptic references in the bible. I realize there are cultural issues to some extent behind the chronic disinformation, blatant lies and absurd distortions. Fact is, Tepco has no idea what they're dealing with and the Japanese government has no credibility. That said, if I had children and lived in Japan, I'd leave the country only to return if, and when, this crisis is sorted. Human life is being compromised in the names of 'stability' and 'honor.' Insane. Even on the West Coast in USA, stability is being encouraged. I am only here because God wants me to be. Otherwise, I would use my common sense and leave. Because we can t hear, see, smell or touch radiation... we all too easily believe the lies in order to not to move and make a state whose economy is shivering away, even more lethal. West Coast should be evacuated. But it won't be until if or when the rates of luekemia and lung caners soar.